The new premium TV from Philips gets powered by a laser backlight. 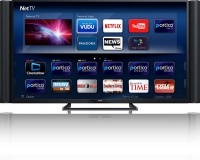 Enjoy mesmerizing images and breathtaking sound. Red Laser plus Cyan LED backlight produces a dynamic viewing experience. Enhancing the experience are 60 Watt RMS stereo speakers with vertically vectored tweeters and dual bass radiators. The elite Pro Cinema LS10000 home theater projector combines revolutionary 3LCD Reflective laser projection and 4K Enhancement Technology2 for the ultimate movie theater experience. Immerse yourself in stunning, crystal-clear images with unbelievable detail, even close to the screen. Offering 1500 lumens of color brightness and 1500 lumens of white brightness1, the LS10000 also boasts an unprecedented Absolute Black contrast ratio, wider color gamut, richer colors and smoother gradations. Full HD 1080p and 4K content come alive in amazing 2D and 3D with Super Resolution and frame interpolation technologies. ISF® calibration tools ensure color accuracy. And, installation is easier and more flexible than ever. Interested? Read the CNET review on cnet.com/products/epson-ls10000/. Over the last few years, interest in laser-based projectors has been increasing within the ProAV industry. Touted as a major technological development that could eventually replace traditional lamp-based systems, manufacturers are bringing various laser-based projectors to market and describing them using terms such as pure laser, laser phosphor, or laser phosphor hybrid. For customers, laser-illumination provides several benefits over lamp-based projectors, however, it’s important to understand some of the differences between these new systems. Interested? Read the full brochure here on christiedigital.co.uk. Ever checked out Panasonics laser projectors? Panasonic provides a very informative FAQ on its laser projectors, for more information check out their SOLID SHINE webpage. Sony presented its new 4K Ultra Short Throw Projector with a laser-light engine. It will be available in summer 2014, the price will be about 30,000 to 40,000 US-Dollars. It's very similar to the Hecto projection system from LG, but more sophisticated. 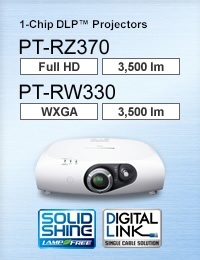 For more information, visit Sonys product page. Big laser projection news from the ISE* 2013! Four different manufactures - Sony, Mitsubishi, BenQ and Casio - presented their laser/laser-based projectors at IES. According to Display Central, Sony showed a 3LCD (no DLP or LCoS) WUXGA (1920×1200) projector with 100% laser light illumination. Sony’s prototype, which will be officially launched at InfoComm this coming June, is rated at 4000 lumens of brightness, both in white and color light output. Mitsubishi presented a new line of LaserVue DLP projectors. These hybrid models build on the same projection technology that Mitsubishi developed for its LaserVUE rear projection TV sets; employing a red LED, numerous blue laser diodes, and a single-segment green phosphor color wheel. NW31U-EST WXGA (1280 x 800 resolution, 2500 lumens). This is an extreme short throw model and will arrive in April. BenQ also showed laser-engined DLP projectors at the show, they use lasers exclusively. Casio had a full line of LED/laser hybrids. The color seems to be considerably better than the first models that came out in 2010 and 2011. Epson is also expected to present some laser based projectors. 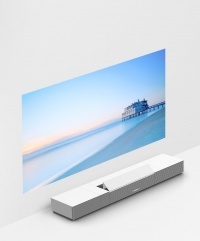 One thing is sure, the FullHD laser-projector Acer K750 DLP-Projektor (1920x1080 Pixel, Kontrast 100000:1, 1500 ANSI Lumen, HDMI, Full HD, S-Video) will get some serious competition this year. * ISE: Integrated Systems Europe, tradeshow for professional AV and electronic systems.